Le Genevois Emile Jaques-Dalcroze (1865-1950) est connu dans le monde entier pour sa méthode d'enseignement du rythme et pour ses chansons d'inspiration populaire, alors même que sa musique de chambre avait sombré dans l'oubli. rend enfin justice à l'oeuvre originale et inspirée de ce grand musicien, disciple de Fauré et de Bruckner. La musique de chambre ( de E. Jaques-Dalcroze) présente également une grande richesse et une belle diversité. Si le quatuor est peut-être un peu trop bavard pour capter l'auditeur de la première à la dernière note, les oeuvres courtes qui l'accompagnent sont, pour certaines, de véritables petits chefs-d'œuvre. L'Ensemble Stanislas sait mettre en relief le caractère original de cette musique qui gagne incontestablement à être découverte. The Genevan Emile Jaques-Dalcroze (1865-1950) is known throughout the world for his teaching method on rhythm and for his popularly inspired songs, whilst his chamber music has sunk out of sight and mind. On the occasion of the 50th anniversary of his death, the Ensemble Stanislas at last do justice to the original and inspired work of this great musician, who was a disciple of Fauré and of Bruckner. The works where caprice and fantasy are dominant are set alongside the quartet , where the melody seems to flow, a harmonious work, balanced, original without ostentation for, while taking classical turns, it apparently corresponds to the personality of the author. It could be his portrait. 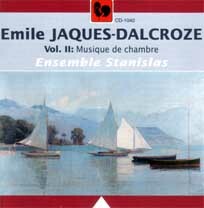 The Ensemble Stanislas presented a very seductive picture of Jaques-Dalcroze, a composer to rediscover. The chamber music (of E. Jaques-Dalcroze) is also of great diversity and richness. Maybe the quartet is a little too talkative to capture the attention of the listener from the first to the last note, but the short works that accompany it are truly little masterpieces. The Ensemble Stanislas knows how to bring out the original character of this music which deserves to be discovered.